Maybe you have been following some of our staff introductions on @adorebridals Instagram. Maybe this is your first time meeting our AMAZING staff! Either way, this is a great read to give you some insight about the friendly faces you will meet when you walk through the doors at Adore. If you read our last blog, you got see an overview of the experience you will get from booking an appointment with us. This week’s blog allows you to get to know the people that help make this experience possible! What inspired you to open up Adore? I started working at David’s Bridal 12 years ago. I had never planned to work in bridal but I instantly fell in love with the industry. It was like the ultimate puzzle. Finding the perfect dress to match each bride’s unique personality. Every day was different and every season brought new styles and trends. It was like I finally felt home in a job! But I quickly ran into more and more things that I felt like couldn’t happen in a big chain like David’s. So I moved into the locally owned bridal world and quickly became discouraged that there wasn’t a place that offered an out of this world experience, with the latest trends in a really cool space. So, one day I thought, why don’t I build my own! What are you most passionate about in the bridal world? Helping each bride feel their best. There are a lot of voices and a lot of opinions, but the one that matters the most is the brides. I want to make sure that she feels more than amazing, more than beautiful but her very best self. And I want to do that with an experience that is all about relationships and filled with all kinds of fun. Basically we want the process to be as stress free as possible. But also in the bridal world in general I LOVE watching the trends. I love seeing how things are influenced and predicting where trends are going. I also love seeing how things cycle back through. That something that was popular maybe 15 years ago comes back with an updated element to make it modern for today! Lucille Ball. Hands down. It was perfect for her body shape. It had an amazing cathedral veil that perfectly blended into the dress. The handkerchief lace hem and the long sleeves. It is classic with a modern twist but timeless. In your opinion, how does social media affect the bridal world? I think social media, especially Pinterest has changed a brides expectation of what they want for their bridal gown, sometimes having pinned their “dream dress” years before they are engaged. While it can be so helpful that a bride knows what she likes… it can sometimes be disappointing to find out her dream dress is $10,000 and discontinued 5 years ago. It can also be super useful as a bridal store to be able to show what dresses we have in the store right now and even as far as using SnapChat to send custom dress picks from our staff before a bride even steps foot in our store. Social media has been a huge game changer in the bridal world! What’s the best part about following @adorebridals on Instagram and FB? I like to think that our Instagram and Facebook is for everyone and not just brides. There’s only a few things that we as women talk about for years on end…. one of them being our wedding. Or future wedding. Everyone loves seeing a bride and I hope that our accounts are a happy place for people to see beautiful photos of weddings and fashion on top of getting a sneak peek of what it looks like to work at Adore or be an #adorerealbride. Adore offers such a unique experience for brides and they truly can get the Kleinfields Say Yes experience but in central Illinois and at a budget they can afford. I love getting the chance to connect with most of our brides! It is so wonderful to get the chance to get to know them a little prior to them even walking in the door! Building relationships with our brides is so special to me! ALSO, we all know I LOVE that “Say ‘yes'” moment!” There is really no better feeling then seeing a bride say “yes” to the dress she Adores! It’s truly special! From you perspective, what is the best thing that Adore offers for their brides? We offer our brides a stress free, fun environment. Wedding dress shopping can become very overwhelming and stressful. We do everything in our power to take all the stress away so that the bride can truly enjoy her special moment and fall in love with her dress! Oh man. This is a tough one for me! I would say here in Morton, I love Thr3ads! I love shopping their clothes! What do you get most excited about when a bride walks through the door? Since we talk to our brides before they even come for their appointment, I get excited that I already know so much about the bride that I can connect with them to help them find the perfect wedding dress! It’s really fun when brides walk in through the door and they feel like friends and family rather than strangers. What would you consider to be your specialty when you are helping a bride? I know that I am a really great listener and really can envision what the bride is wanting. Even if I don’t talk the entire appointment, it’s because I am ultimately there to help the bride. I want to be able to be supportive and listen to what the bride is really looking for. It’s ALL about the bride! My favorite floral arrangement would be more cascading greenery, with florals in deep jewel tones…maybe even some feathers! I think it looks so gorgeous! Tell us something not everyone would know about Adore. 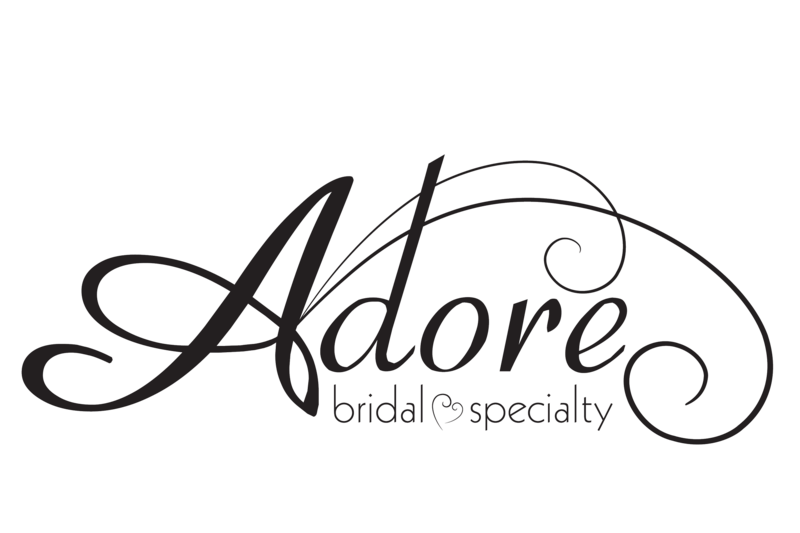 So I feel like Adore has so many amazing things that you don’t even realize until you walk through the bridal process with us. If I had to chose, I would have to say I am REALLY passionate about our bridesmaid selection. We talk a lot about bridal, but honestly we are here for your whole entire party. We have budget-friendly dresses, comfy fabrics, fashion-forward choices, sequin gowns..seriously, show me your inspiration photos & we can create that look for you! We have so many more bridesmaid options than I think most people realize until they make an appointment with us! Where does social media come in to all of this? I love the platform and the voice that social media gives our store. Thanks to Insta and FB, we get to connect with so many previous brides, future brides, and local vendors. I personally love when brides tag us in their wedding photos because the whole process comes full circle. We get to walk along brides through the decision process and get a glimpse into their big day! I mean how cool is that?! Additionally, our followers get a look into staff life at Adore, are the first to see big events, and just talk about the current trends, so don’t miss out! Follow us at @adorebridals and join the party! I draw a lot of inspo from high fashion accounts, so it’s hard to pick just one. I think that’s why @voguemagizine or @wwd are probably my favorites because you get to see a little of everything. What’s something every bride should know about Adore? That we LOVE our brides! We will always go the extra mile for our brides, we will make every effort to get to know them and what they want their gown to look like even BEFORE they come in the store. We genuinely enjoy what we do and want to find the perfect dress. Once you say yes to your dress and sign that wall, you become part of our Adore family! Can you recall a memorable experience when working with a bride or bridal party? Please share! I always love brides & bridal parties that are so sweet and are there to enjoy the experience of that “yes” moment. I don’t know if I have a specific appointment in mind, but my FAVORITE thing is when the #adorecouchcrew squeals with excitement when the bride is in her dress! Not everyone has that crying/tearful/get-me-a-tissue moment people…sometimes it’s just the sheer excitement when she says YES!!! Jumping up and down, laughing, hugging…I love it. It is such a special moment. I would say TiAdora! I love their boho style and the beautiful lace patterns. They have so many unique designs that you don’t see often and have not been “overdone.” Their gowns all have a very organic feel, but are still timeless and beautiful! What do you love about the bridal world? The ever changing styles. I’ve been working in bridal for 7 years, and even when I took a break from bridal I still followed designers to see their new dress releases. That especially runs true for the “curvy bride.” I love that there are so many new style options & designers that are catering towards those curvier body types! The type of wedding dress I originally wanted when first working bridal ended up being nothing like the wedding dress I ended up getting because the style had changed by then. I’m sure if I was to look for a dress now it would be totally different again. What’s something brides should know if they get the chance to work with you? I listen intently & care deeply. It’s not uncommon for me to tear up right along with my brides & their families during those special moments. I have a favorite wedding scene, not really a wedding movie. Ever since I was a kid it has always been the wedding scene from The Sound of Music. Even after all the movies that have come out since then, that remains my favorite. I love the music, the scene, & her dress! It’s very Grace Kelly-like, and we see that trend coming back now so I’m loving it! What part of the bridal process do you love to walk brides through? My favorite part of the bridal process is helping a bride find her style. I love when brides come in not knowing what they want because it’s kind of a blank slate for me to work from! (It’s also so much fun with brides that know what they want too!) I love watching a bride light up in a gown they love. It makes my job so much more meaningful and I love being apart of it. What’s the best part of the Adore experience from your perspective? The best part of the adore experience in my opinion is how personal each appointment is. I love that we get the opportunity to really get to know our clients on a personal level. It makes each appointment that much more meaningful and I love hearing everyone’s story on how they met there fiancé. Of course I also love hearing how excited they are to find their perfect dress and the fact that I get to help them find it! My favorite spot is definitely Eli’s. We have one in Tremont and they know my order before I even pull up… maybe that’s not such a good thing haha! From the staff at Adore, we thank previous brides for letting us play a part in their big day. We have LOVED working with you! As for future brides, we cannot wait to meet you!